It’s already another crazy busy work-filled week and I basically just gave up sleeping. Because, I mean, sleeping isn’t really that important, is it? 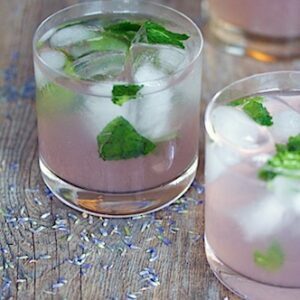 I know, I know; i’m totally going to get sick, but I’m just trying to push through while seriously dreaming of Friday evening. You know, with my eyes open and all. Despite all the stress and sleeplessness, I have found several things that have made me smile this past week. Thank goodness. Everyone on this list is getting one huge virtual hug from me. And my apologies if I fall asleep sitting upright in my chair and start drooling. I can’t be blamed. 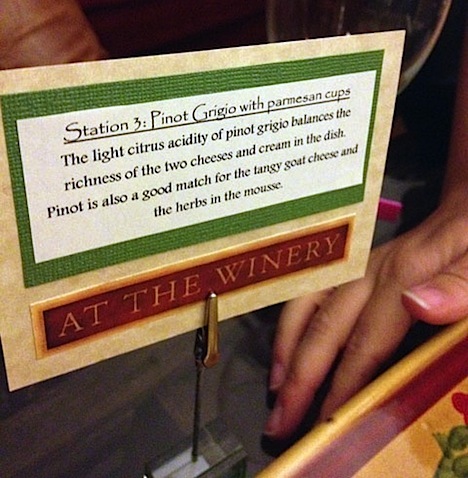 On Saturday night, Chris and I went to Kyle and Jeff’s 2nd Annual Wine Tasting Party. 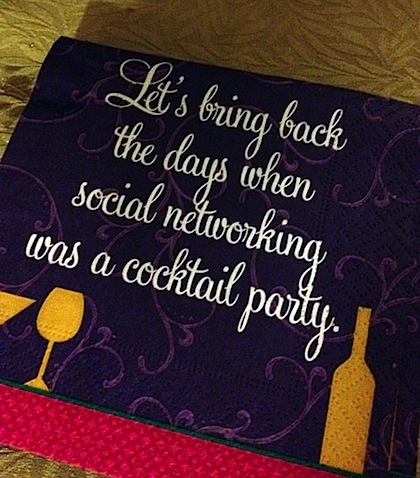 You may remember last year’s party… Well, they somehow managed to outdo themselves this year! It. was. incredible. I was honestly feeling a little blah about going out just because I was so completely drained and still had so much to get done, but I wanted to see my friends and knew it would be good for my soul. And yup, it was! Not only was the food (and wine!) out of this world, but the company was fabulous, too. Kyle and Jeff and all their friends are so much fun and sadly, it’s been a while since I laughed as much as I did during the evening. It was definitely needed! And yes, everything on the menu was made. 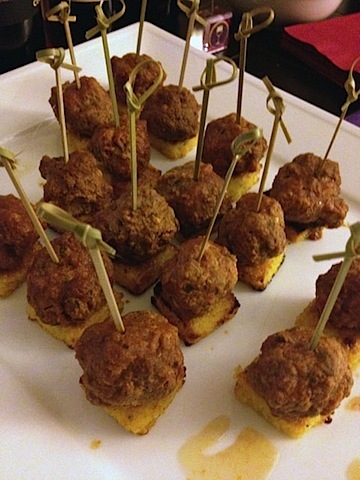 By Jeff (with help from his sous chef, Kyle, of course). 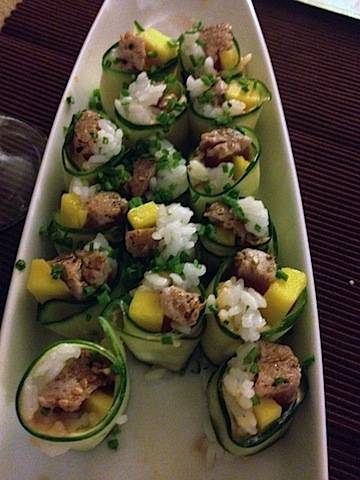 From the tuna cucumber rolls. 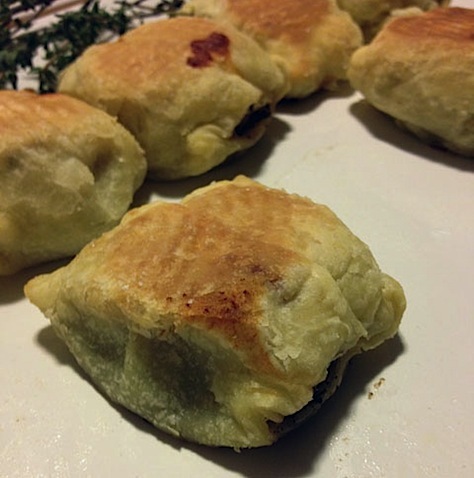 To the mini beef wellingtons. 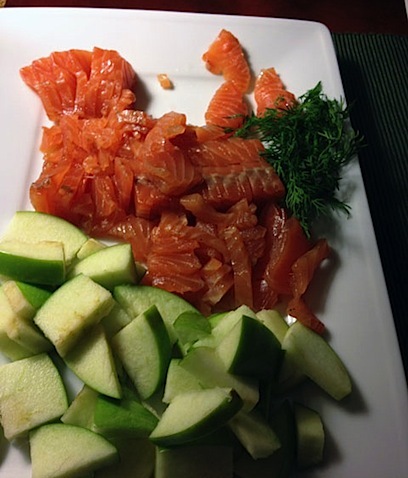 To the salmon that he cured himself. 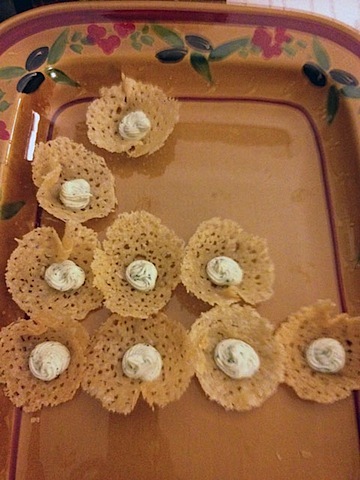 To the parmesan cups with goat cheese mousse (that I’m pretty sure Chris ate 94034930 of). 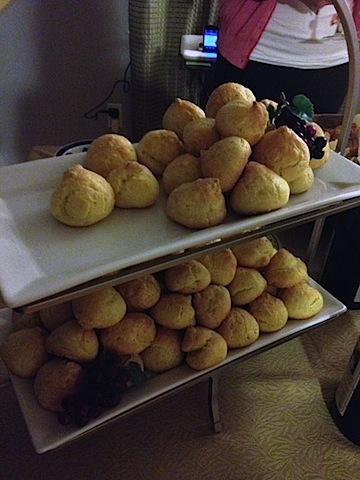 To the gougeres (that once you start eating, you can’t stop). 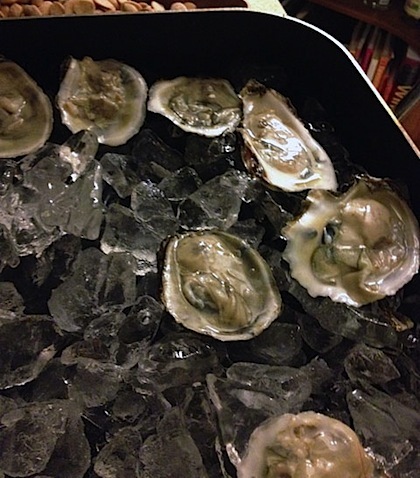 To the super fresh oysters that Jeff picked up that day. 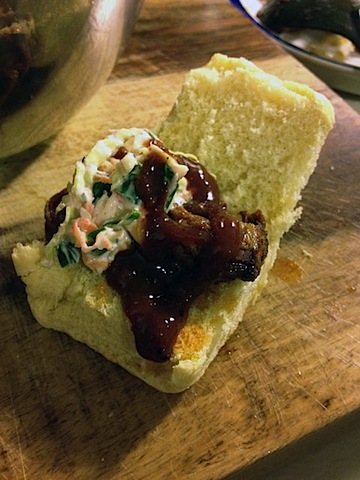 To the pulled pork sliders with all the fixings. 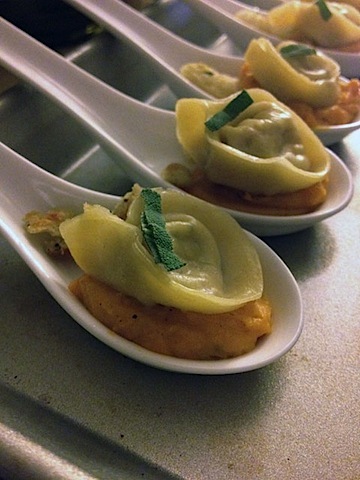 To the chicken saltimbocca tortellini with butternut squash. 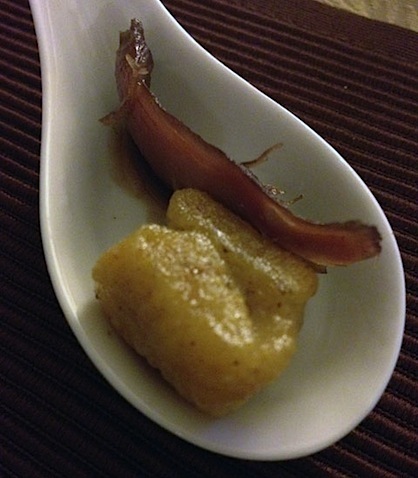 To the duck confit with sweet potato gnocchi and pomegranate sauce. 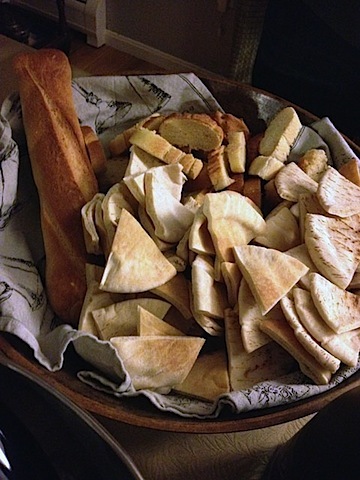 To the homemade bread and butter that Jeff just happened to whip up in case anyone was still hungry. OK, I’ll stop. But sometimes I can’t even believe how lucky I am to have such talented friends. I mean, really? I’m SO lucky. 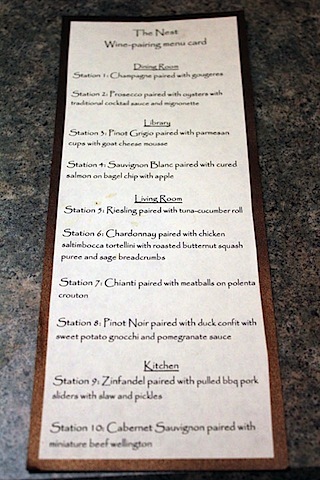 Of course, each dish was paired with signage and a few bottles of wine. Kyle and I were just joking that we’re laughing uncontrollably in every photo we have of ourselves together. And yup, not much changed this time. I’m pretty sure that says A LOT about our friendship! Now, I’m just wondering what they’re going to do next year. No pressure or anything, guys 🙂 But really, this is going to be tough to beat! When I walked in the door on Friday night, absolutely exhausted, I walked in to this package from the lovely Maggie of Eat Boutique. Seriously? Was she in my apartment spying on me and realizing how much I needed this pick-me-up? Just kidding, she’s not creepy. She’s just awesome and must have some kind of crazy intuition. Because this most definitely made my week. 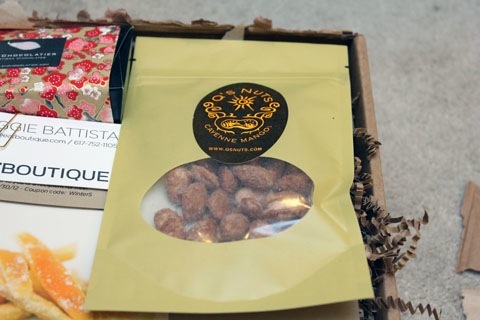 In case you don’t know about Eat Boutique, they’re not only a food magazine, but also a market “for food enthusiasts to celebrate the best pure, local, and comforting handmade foods.” They sell gift boxes packed with artisanal foods sure to put a smile on anyone’s face. 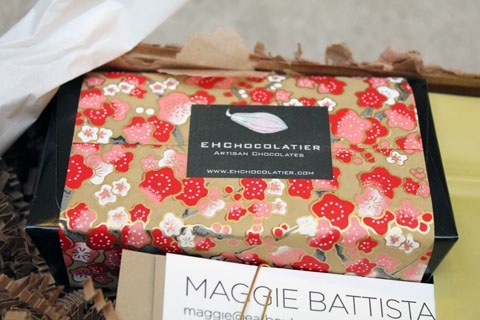 You can buy someone a singular gift box to make their day a little brighter, or you can get a monthly subscription to make someone’s entire year incredible. 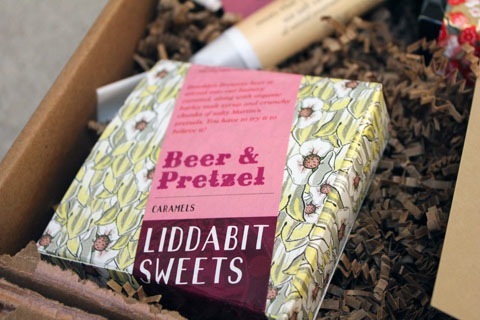 And beer and pretzel caramels in an adorable package. Chocolates always make my stresses feel a little less. And cayenne mango nuts? Absolutely crazy considering I was just raving about the wonders of sticking cayenne and mango together. But seriously, Eat Boutique is most definitely going to become my go-to for sending a gift when I want to lift someone’s spirits. Thank you SO much, Maggie! 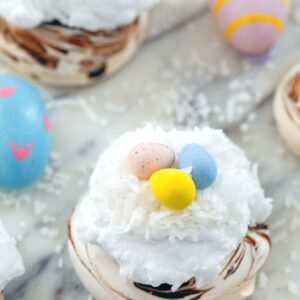 Though I haven’t been finding much time to spend in the kitchen lately (this seriously makes me sad), I did spend a good 6 hours with Chels baking cupcakes yesterday. We’re heading to High and Mighty‘s launch party for their new beer, Don Cornelius, tomorrow night. 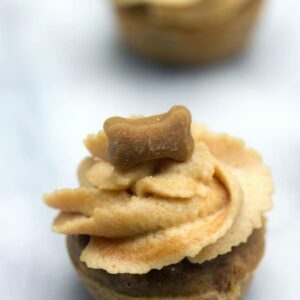 And they asked us to make cupcakes for the big event! Of course we said yes. Have you ever known me to say no to combining cupcakes and beer? 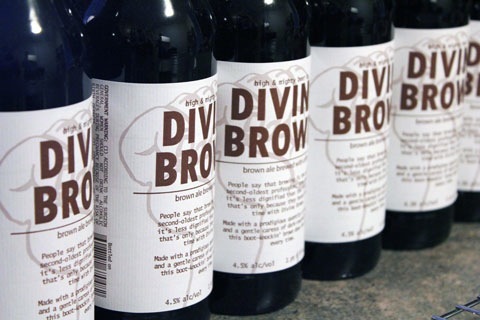 They gave us a nice stock of their Divine Brown beer. And we whipped up some chocolate cupcakes with the beer… And a nice chocolate bourbon filling (after all, their new Don Cornelius was aged in bourbon barrels). I was too drained after being on my feet frosting cupcakes for 6 hours to snap any photos. But that just means you’ll have to come to the Otherside Cafe tomorrow night at 6 p.m. for the launch and our cupcakes. I’m hoping I’ll be able to stop by for at least a little bit. I want to see our cupcakes on display, after all… And enjoy some Don Cornelius! They even mentioned us in the DigBoston article! Since my mom knows both Chris and I have been pretty overloaded and that I haven’t been able to get in the kitchen as much as I’d like to (slash need to to actually eat a well-balanced meal or two), she and my dad sent dinner home to us the other night. This was seriously a life-saver and put a HUGE smile on my face. We probably would have been eating cereal or spending lots of moolah on take-out. 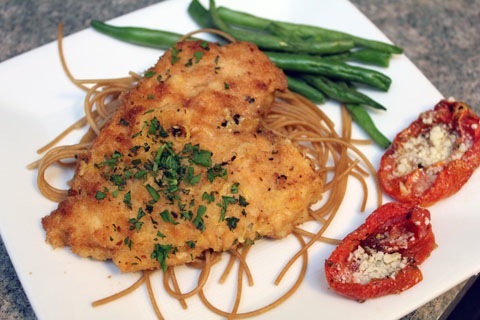 But instead we had a gourmet meal of chicken piccata with green beans and parmesan tomatoes. Delivered straight to our door by my fabulous sister. Does it get better than that? It’s been dinner for two nights and I’m starting to think my parents should launch their own delivery service. We’d be ordering every night! So, at leas there’s some fabulousness going on there. Here’s to hoping this week brings forth a few more things to make me smile! What’s been making you smile recently? 10 Responses to "Sues’s Favorite Things #20"
that is so sweet that your family “delivered” your dinner! And wow! you do have some TALENTED friends!!! 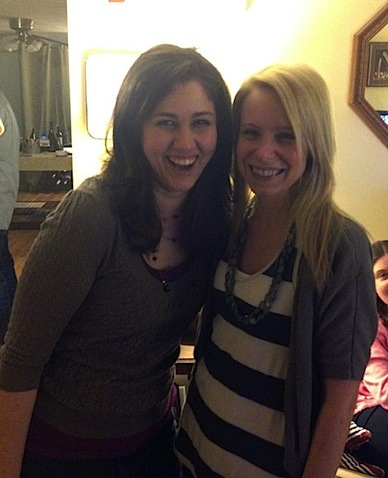 Hanging out with my bridal party and going bridesmaid dress shopping put a BIG smile on my face this weekend! 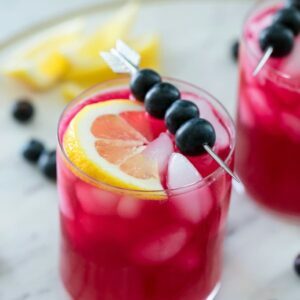 That wine party is impressive – puts all of my cocktail parties to shame! Thinking about my ski trip weekend is making me smile! 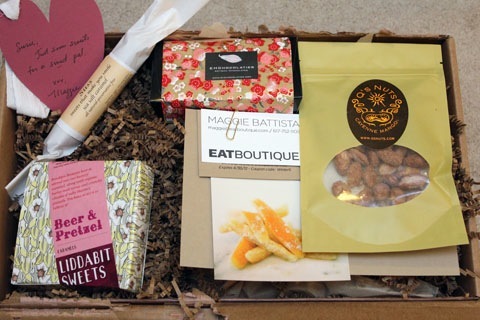 That Eat Boutique box is precious! I will probably get one for myself soon 🙂 Also, mini beef wellingtons?! Next project. Good luck with the rest of the week! I want to come to the party too!!! That gift box is so sweet too and the best gift idea ever. Simply desire to say your article is as amazing. The clearness in your post is simply spectacular and i could assume you’re an expert on this subject. Fine with your permission let me to grab your RSS feed to keep updated with forthcoming post. Thanks a million and please keep up the enjoyable work. Fantastic goods from you, man. I have understand your stuff previous to and you’re just too fantastic. I really like what you have acquired here, really like what you’re stating and the way in which you say it. You make it enjoyable and you still take care of to keep it sensible. I can not wait to read far more from you. This is actually a great website.